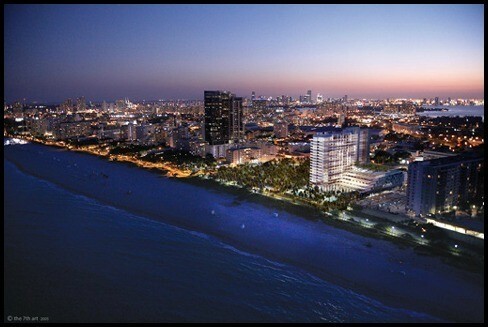 South Beach is a neighborhood in the city of Miami Beach in between Biscayne Bay and the Atlantic Ocean. South Beach is the part of Miami Beach that is alive 24 hours a day with entertainment; hundreds of nightclubs, restaurants, hotels, and shops line the beach. The area is easy to navigate because of its numerical streets running east and west while the principal roads run north and south. Walking and biking are the most popular modes of transportation, but the bus system is also available for residents without a vehicle. There are many parks and recreational activities in the area along with the world famous beach. The incredible weather allows you to enjoy these outdoor attractions year round. There are schools in the area for residents with children and many family friendly activities such as the many camps, festivals, museums, and beach activities. During the day, shopping, exploring museums and relaxing at the beach make South Beach seem like a normal beach town, but at night the whole city comes alive. South Beach is famous for its nightlife. Restaurants, lounges, and nightclubs open and the city becomes a different place than it was mere hours before. The music, dancing, and socializing creates a perfect atmosphere for fun and excitement. It is not uncommon to see celebrities partying right next to you or performers gracing the stage. This level of nightlife is not found anywhere else in South Florida. Not only are the clubs and lounges popular, but some of the finest destinations for dining and shopping are found in South Beach. The amount of attractions and activities in South Beach cannot be rivaled, which is why South Beach is the most famous city in Florida.